We’d love your help. Let us know what’s wrong with this preview of First Generation by Sandra Neil Wallace. Celebrate the genius, diversity, and grit of immigrants and refugees in this boldly illustrated guide to 36 American trailblazers. The men and women in this book represent nations from Somalia to Germany, from Syria to China, from Mexico to Sweden, and more. They are people like Secretary of State Madeleine Albright, international singing sensation Celia Cruz, star basketb Celebrate the genius, diversity, and grit of immigrants and refugees in this boldly illustrated guide to 36 American trailblazers. To ask other readers questions about First Generation, please sign up. First Generation is a must-have for classrooms. An inspirational anthology of 36 immigrant and refugee stories reveals that with hard work and passion one can do anything. After reading the novel Refugee with my class, students read about real-life immigrants and refugees from science to sports, from politics to performers, and from old to young. First Generation has deepened student’s understanding of the courage, determination, sacrifice, and passion of 36 immigrants and refugees and the posit First Generation is a must-have for classrooms. An inspirational anthology of 36 immigrant and refugee stories reveals that with hard work and passion one can do anything. After reading the novel Refugee with my class, students read about real-life immigrants and refugees from science to sports, from politics to performers, and from old to young. First Generation has deepened student’s understanding of the courage, determination, sacrifice, and passion of 36 immigrants and refugees and the positive impact they have made on our world. First Generation brings awareness of the contributions that Madeleine Albright, Martina Navratilova, Razia Jan, Yo-Yo Ma, Sergey Brin, John Muir and thirty others have made. I especially like the format of the book. It is designed with a one-page biography facing a page with a beautiful illustration of the person, a quote, and a textbox with two or three interesting facts. The author's note, bibliography and resources are also helpful. It is important to hear their stories and I highly recommend First Generation for all classroom and home libraries. This is a collection of 36 short (1 page) essays about 36 migrants who became Americans and who contributed in some way to the promotion of civil rights or the betterment of the nature or the world. The selection is evenly split between male and female. Of these, only Albert Einstein was someone's whose essay read as a repeat of what I already knew. Even people I did know, I learned more about in this pages. The cartoons of them are well done, I think they show energy and character. Each person This is a collection of 36 short (1 page) essays about 36 migrants who became Americans and who contributed in some way to the promotion of civil rights or the betterment of the nature or the world. The selection is evenly split between male and female. Of these, only Albert Einstein was someone's whose essay read as a repeat of what I already knew. Even people I did know, I learned more about in this pages. The cartoons of them are well done, I think they show energy and character. Each person has a highlighted section of new information that could have easily in a lesser book been to just repeat facts.It was fun and quick to read, easily accessible to anyone from grade school on up. Everyone has a story to tell. Everyone's story has value. By hearing the stories of others we learn. When we learn we grow toward being the best we can be. We know all of this to be true. We need to remember the person we pass walking down a street, pushing a grocery store cart, sitting at a table in a library, or sitting or standing with us, waiting in a line, has a story we might need or want to hear. If we listen to their story or read their story, it further validates them and us as human bei Everyone has a story to tell. Everyone's story has value. By hearing the stories of others we learn. When we learn we grow toward being the best we can be. We know all of this to be true. We need to remember the person we pass walking down a street, pushing a grocery store cart, sitting at a table in a library, or sitting or standing with us, waiting in a line, has a story we might need or want to hear. If we listen to their story or read their story, it further validates them and us as human beings of worth. First Generation: 36 Trailblazing Immigrants And Refugees Who Make America Great (Little. Brown And Company, September 4, 2018) written by Sandra Neil Wallace and Rich Wallace with illustrations by Agata Nowicka is captivating and illuminating at every page turn. This book is amazing. I loved reading it. It really made me want to learn more about the people. I kept finding myself taking research breaks to learn more about those people. The illustrations were gorgeous and clearly thought out to fit each person and their career/passion. It has a great range of people (past, present, genders, races, religions, etc.). I highly recommend it for upper elementary through junior high for libraries, classrooms, research starters, etc. 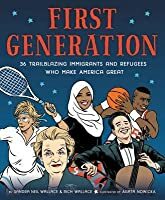 An interesting anthology that provides information on "36 Trailblazing Immigrants and Refugees" who have hit the mark in making America a better place, in this world. Some people are easily recognizable (Einstein, Madeleine Albright, Martina Navratilova, Carlos Santana, etc. ), while others were people I had never heard of or knew very little about. Reading this as a book club with my 5th graders. Quick read. Lots of different people, in lots of different fields, with lots of different stories. There are so many different directions I could take this book with my students. So many places to talk about. A good introduction on people doing great things. I love this collection of short articles that share the accomplishments of both immigrants and refugees who have indeed shaped our country. This is a must for classroom and school libraries, especially those with student researchers who want to learn about more than the typical American figures. Overall, a fantastic collection. I merely wish there had been a consistent sidebar or framed text for each entry that included basic biographical information such as DOB, place of birth (often included in the text), etc. This book was honestly sooooo inspirational. It shows how successful people can be and how immigrants have done pretty amazing things. This book also showed that with hard work and passion, one can do literally anything!!!! I also loved the pictures and the overall layout of the book!!! I love how a big middle finger towards Trump has even seeped into the world of children's literature. Anything that gives a middle finger to him is 5-star worthy. However, this collection of short bios is excellently done. A wonderful reminder about the strength of the human spirit and the unlimited opportunities that are before many of us on a daily basis. Read this if you want to be inspired by a diverse variety of people and stories. Terrific, well illustrated, collective biography. Immigrants make America great! If anyone doubts that, read this book of trailblazing role models! I love the diverse figures included in this book and am happy to add it to my classroom library! Good very short intros to lots of important immigrants and refugees. Inspiring amazing, and surprising people. Immigrant who made America their home and contributed in numerous ways. This timely collective biography tells the inspiring stories of 36 first generation immigrants or refugees who, for various reasons, came to live in the United States. All faced obstacles such as discrimination but through hard work, sacrifice, and perseverance built successful lives and made significant contributions to their new country. The men and women profiled come from countries all over the world including Ethiopia, China, Afghanistan, and South Korea. They represent various fields such This timely collective biography tells the inspiring stories of 36 first generation immigrants or refugees who, for various reasons, came to live in the United States. All faced obstacles such as discrimination but through hard work, sacrifice, and perseverance built successful lives and made significant contributions to their new country. The men and women profiled come from countries all over the world including Ethiopia, China, Afghanistan, and South Korea. They represent various fields such as science, business, music, food, and sports. Their contributions include the pentium chip, salsa, the Sierra Club, and Google. Some, such as Albert Einstein, are well known but many of these inspiring individuals will be new to the children reading this book. Each of the men and women are featured in a two-page spread with highlights of their struggles and achievements, interesting facts, and a brightly colored portrait. Students will be excited to read about immigrants of different races, religions, and cultures who have made positive contributions to their new country. The writing is upbeat and positive and will cause students to want to learn more about these fascinating people. (Sources for more information are included). The authors have included ideas for students to become trailblazers themselves by reaching out to immigrants and refugees.